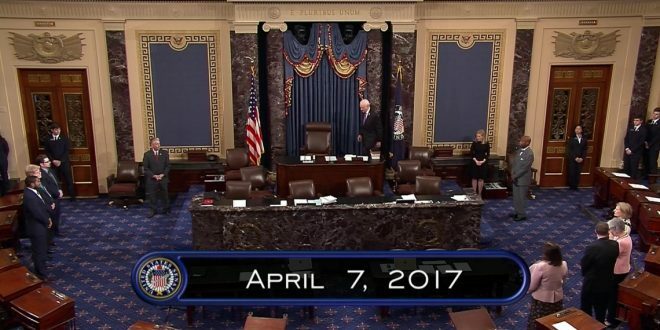 LIVE VIDEO: Final Senate Vote On Neil Gorsuch - Joe.My.God. The Senate will continue debating the confirmation of Neil Gorsuch as a Supreme Court justice Friday morning. A vote is expected around 11:30 a.m. ET. Gorsuch only needs a simple majority approval to receive confirmation. The chamber moved toward making him the ninth Supreme Court justice Thursday by voting 52-48, along party lines, to take the “nuclear option,” removing the 60-vote threshold to advance Supreme Court nominations. Earlier Thursday, Democrats blocked the cloture vote on Gorsuch, President Donald Trump’s pick for the court.